This is why block grants are a terrible idea. Now that Kansas has passed the most niggardly*, stingy, punitive TANF rules on the planet, they just might find themselves in trouble with the federal government. The way TANF works now, by the way, is the way Republicans want Medicaid to work. The federal government block grants money to the states, and the states get to decide how that money is doled out and used. Kansas is a shining example of why block grants for any assistance is a terrible idea. A first-of-its-kind provision that prevents welfare recipients in Kansas from withdrawing more than $25 a day from an ATM might violate federal law, and could jeopardize the state’s federal funding if not amended. 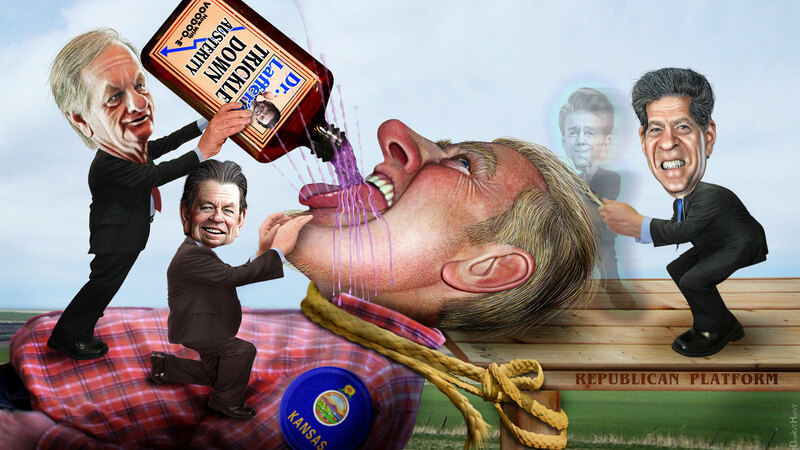 State Senator Michael O'Donnell (R-Koch) is now concerned that the state could lose out on the federal goodie bag. O’Donnell not only voted for the original welfare bill, but introduced it on the floor of the state senate. He also voted for the amendment that capped ATM withdrawals at $25. He said he would have strongly opposed the amendment had he been aware that it might contradict language in the Social Security Act, a copy of which had been sent to him by a reporter on Thursday. Because the $25 limit came as a floor amendment, O’Donnell said, it wasn’t thoroughly vetted through the usual committee process. What a dumbass. If he couldn't be bothered to vet his mean-spirited, nasty punch down on people already down and out, he should have just left it alone. Instead he had to grandstand in order to smack down the poors. Now it looks like he's the one who will be slapped, and not a moment too soon. *For those unfamiliar with the word "niggardly," be reassured it has no relationship to a similar-sounding racial slur, and perfectly describes the nature of this bill. It's a perfectly good word which should not cause anyone to be offended. Different spelling, origin, and meaning.